(Nanowerk News) An international team of physicists has used carbon nanotubes to enhance the efficiency of laser-driven particle acceleration ("Ion Acceleration Using Relativistic Pulse Shaping in Near-Critical-Density Plasmas"). This significant advance brings compact sources of ionizing radiation for medical purposes closer to reality. The interaction of high-intensity laser light with solid targets could someday serve as the basis of table-top sources of high-energy ions for medical applications. An international team led by physicists of the LMU affiliated with the Munich-Centre for Advanced Photonics (MAP), a Cluster of Excellence based in Munich, and in cooperation with scientists from the Max Planck Institute of Quantum Optics, has taken another step towards this goal. They have done so by boosting the efficiency of a technique that uses extremely intense pulses of laser light to eject packets of high-energy ions from diamond-like carbon foils. In their experiment, the researchers coated one side of the foil with carbon nanotubes. Upon laser irradiation, the layer acts like a lens to focus and concentrate the light energy on the foil, which results in the production of much more energetic ion beams. This makes experiments with high-energy carbon ions on cells feasible for the first time, and brings light-driven generation of ionizing radiation closer to practical application. Light is an enormously powerful and versatile source of energy. 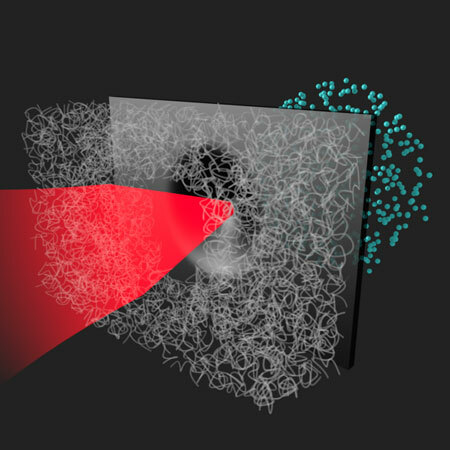 When high-intensity pulses of laser light are fired at ultrathin diamond-like carbon (DLC) foils, they punch through the foil, stripping electrons from the atoms. The negatively charged electron cloud then drags a stream of positively carbon ions along, accelerating them to speeds of up to 10% of the speed of light. The bursts of carbon ions produced by the radiation pressure exerted on the foil by ultrashort laser pulses could be used to treat tumors, provided the ions pack sufficient energy. At present, the only machines capable of producing such high-energy ion beams are large and highly expensive particle accelerators. Laser-based technologies are as yet unable to generate beams of comparable quality. However, light-driven approaches offer a possible route to much more compact and far less costly ion sources for medical applications in the future. To reach this goal, laser physicists need to increase pulse intensities, and find ways to ensure that much more of the incident light energy is delivered in concentrated form to the carbon foil target. MAP physicists have now taken a significant step toward the latter objective. Each laser pulse fired at the target lasts for 50 femtoseconds (a femtosecond equals a millionth of a billionth of a second), and consists of about 20 oscillations of the optical field. This means that not all of the electromagnetic energy associated with the optical pulse reaches the target at the same time. It arrives in dispersed form, so that the radiation pressure acting on the target atoms rises gradually to a maximum, then drops off again. Since only the peak energy is sufficiently high to rip ions from the foil, the process is not terribly efficient. Ultrathin foils of diamond-like carbon were first used in studies of radiation pressure acceleration five years ago. For the latest experiments, technicians at the MAP Service Centre used vapor deposition to coat the front of each foil with carbon nanotubes. The nanotubes come to lie on the surface in a higgledy-piggledy fashion, like blades of grass in a haystack. But the plasma formed when the laser pulse impinges on the nanotube coating effectively acts like a lens. As a result, the power of the incident pulse is concentrated sufficiently to permit immediate ionization of the underlying carbon foil. In addition, the nanotube coating focuses the light pulse onto a very small area of the target. These two effects together enhance the energy of the carbon ions ejected from the foil to around 200 MeV (mega electron volts) – significantly higher than was previously attainable. In a collaborative effort involving researchers from Germany, the UK, Spain and China, the experiments were carried out with the ASTRA-Gemini laser at the Rutherford Appleton Laboratory in Didcot (UK), as part of the Laserlab Europe Program. The higher energies now available make it possible, for the first time, to carry out experiments on cells with beams of carbon ions. However, because the radiation must pass through healthy tissue before it reaches a tumor, energies of at least one GeV (gigaelectronvolt) will be required for clinically relevant applications, about five times higher than that attained in the latest experiments. But boosting power output to this level is not an impossible dream. On the basis of the expertise available at the Munich-Centre for Advanced Photonics, a new Centre for Advanced Laser Applications (CALA) is now being built on the High-Tech Campus in Garching. CALA will house a novel ultrashort pulse system, called ATLAS 3000, which is designed to provide laser pulses with powers of up to three petawatt. In combination with the energy enhancement made possible by the nanotube-coated carbon foils, this system promises to bring the era of light-based sources of ionizing radiation a lot closer.